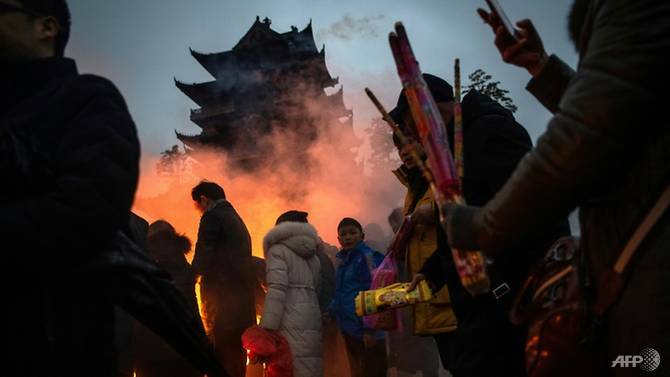 WUHAN, China: Thousands of Chinese worshippers crowded into a temple in the middle of the country on Saturday (Feb 9) to pay homage to the God of Wealth and pray for good fortune. "Chinese tradition says that it is the birthday of Caishen, so I am here to celebrate," Gong Xinwen, a young woman who has been coming to the temple with her parents since she was young, told AFP. This year, she has a special request for Caishen - that she may have a child during the year of the Pig, that will carry the animal's zodiac sign, which is associated with good fortune. "The pig is a blessing," she explains. On Monday night and into Tuesday, the Chinese celebrated the ChineseNew Year, which falls on a different date each year, although always in January or February. In a country with almost 200 million internal migrants, the return home by workers during the festival season is the world's largest annual migration.